Get the attendance System for Multi Locations for monitoring attendance of employees. Biometric Time Attendance M/C – Online Software Multi Location. Finger Thumb Time Access machine Card Face Centralized monitoring Best Software. Organizations/ Enterprises with multi-location presence are facing a big challenge in maintaining attendance and payroll data of their employees. We offer the concept of push data to solve this. This solution requires One server and one public IP. This eliminates the installation of servers/software all over the branches. Clients with multiple branches can use our solution for attendance management. We provide hardware and software to capture and process attendance. With over 350 plus industry standard reports which can be pulled in excel or word format. 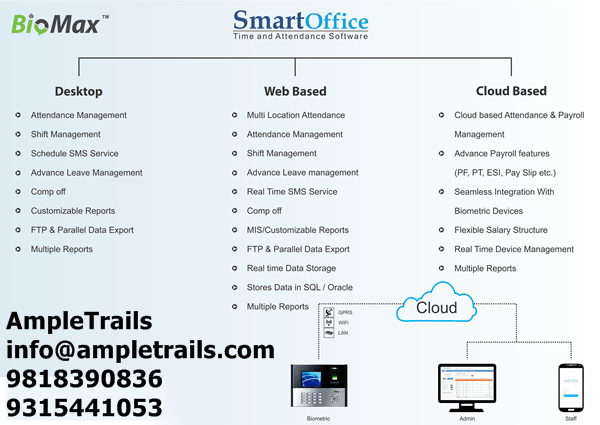 The state of art technology help you in the seamless capture and manage the attendance or whole organization. Idle of the organization having multiple locations. Single server for multiple locations. 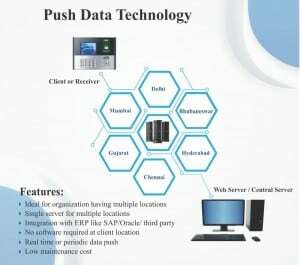 Integration with ERP like SAP/ORACLE/ third party. No software required at the client location. To know more get in touch with our experts now. Call us at 9818390836, 9315441078 WhatsApp 9315441053 or email at info@ampletrails.com or fill the following form. Supports and integrated with all major Biometric devices. Available in Desktop, Web and Cloud versions. Error Free Payroll processing & compliance management. Pay Slips, Form-16 & Bank Statements for salary remittance. Loans/Advances with the flexibility of managing the EMI/Premium. Export Journal Vouchers for Tally/SAP or any other ERP.